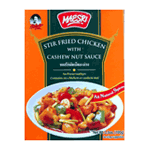 Thai stir fried chicken with cashew is one of many stir fry recipes that came to Thailand via the Chinese. Very popular in Thai restaurants, this famous chicken stir fry recipe is made with lean chicken breast, shiitake mushrooms, plus suey choy, bok choy, or other Chinese greens. Cashew chicken is a simple stir fry paste that is easy to make, plus healthy and delicious. Enjoy it with Thai jasmine-scented rice or Thai sticky rice for a nutritious and satisfying meal. Product of Thailand.